The town itself got off to a faltering start for us, when we decided to cycle in. Only about 4-5km, along the coast – what could possibly go wrong with that? A nice little bimble, keep the sea on your left, Bob’s your uncle. Remember what I said about that golden rule? Yep, it applied again. The route was far from clear, far from flat, and far from the sea. As we clambered up steep hills through a semi-industrial-agricultural wasteland, with ripped poly-tunnels everywhere, we had no real clue about whether we were actually heading towards the centre. A very steep descent took us back to the sea, and along past a heavingly full beach, before heading in to a confusing mess of traffic. With a mental groan at the thought of how we’d ever find our way back again – and whether we’d be able to face that hill even if we could – we headed past the market on the edge of the old town. Suddenly – those worries disappeared, as a car door opened in slow motion right in front of my bike. I couldn’t jink around it – there was a car right next to me, too. BANG. Fortunately, I wasn’t going quickly, and stayed upright. The handlebars had gained a jaunty angle, and the gear shifter was smashed. My shoulder ached, but didn’t seem to be badly injured. The driver leapt from his car, shouting. He quickly realised I was a tourist, and switched to English – fortunately, it was profuse apologies, and I managed to prevent Ellie from performing some unusual arrangements of his anatomy and car door. The bike wasn’t going to be going anywhere under it’s own steam, though, and I was going to have to waste time, energy and money finding parts to fix it. No, wait – the driver, Stipe, turned out to have a friend who runs a bike workshop… We locked the bike to the railings, and decided not to write the entire day off. Time for a quick once-around town. Split started off as a retirement home, with a grand total of one resident – Diocletian, Emperor of Rome, and a local-boy-done-good. The palace later became derelict, but the outer walls formed the perfect defences for the fledgling city, and stand tall still. 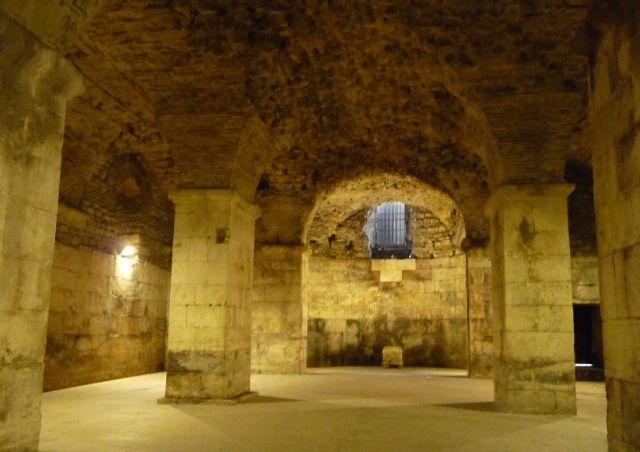 Inside, there’s only a few of the original buildings intact – Diocletian’s Mausoleum, now the Cathedral, and the Temple of Jupiter, now the Baptistry. The basic layout remains, with many of the streets and the peristyle (main courtyard) still very much part of the current city plan. Underneath where the Palace’s main block would have stood, the basements provide a wonderfully atmospheric guide to the original floorplan. Ignored for many centuries, they’ve only recently been unearthed and cleared, giving the original walls and supporting structures a life of their own. The old town spills out of the palace walls on one side, giving a different feel. It’s this side of the city which provides a home for the fish market – one of the best we’ve seen for quite a while – actually, about the only one we’ve seen whilst it’s been open, if truth be told… Down the waterfront, a broad pedestrianised boulevard (resplendent in the name of Obala Hrvatskog Naradnog Preporoda – Quay of the Croatian National Revival – but known to everybody as the Riva) is lined with cafes looking out over the harbour. It’s a really easy city to like, despite the ubiquitous crowds of cruise-liner tour groups being herded through. You don’t need to go far out of your way to leave them all behind, and find small shops selling all sorts of everything. The old town still lives and breathes as it wants to, living from the hordes of tourists, but not being dictated to by them. We found a bar, hidden in the city walls, with a great view over the top of the Riva and onto the harbour. We seemed to be the only tourists there, as we sat with a cold beer and a plate of simply superb local ham and cheese. 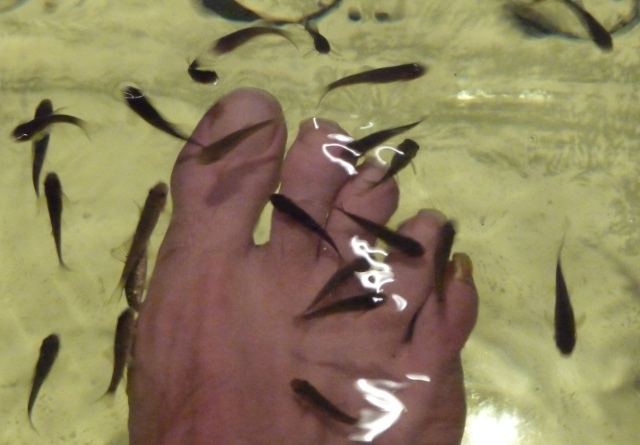 Just around the corner from the fish market, we passed a small shop to a chorus of giggles and gasps from inside – intriguing… It turned out to be a fish spa, where the escapees from the fish market turn the tables on humans. You sit, with your feet in a pool of water, as your toes are nibbled at and any dead skin etc is cleansed from them. The sensation was not unlike a mild electric shock at first, as a throng of little black fish crowded round and did their job, fangs bared. Did it make any tangible difference? Difficult to say, but it felt so – and the pleasant tingling lasted for hours afterwards. Getting the bike fixed, of course, turned out not to be as easy as it could’ve been. After a quick game of game of telephonic chinese whispers with Stipe, via the campsite receptionist “to prevent any misunderstandings”, we found the workshop, in the middle of a suburban pedestrianised shopping centre. Except they quite clearly had no idea who I was or what I was talking about, nor did they much care. Eventually, I persuaded them to call Stipe, who met us at the door in about a minute flat. Turns out it was the wrong bike workshop. The guy at the right one was helpful and friendly, but about to close up for the night. So we left the bike there, with an arrangement to collect it, fixed, the following morning. 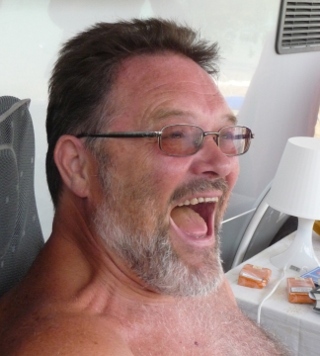 You guessed it – when I rolled up, not only had it not been touched, but the guy who knew why it was there wasn’t working that morning – and his colleague was swamped and hassled… Eventually, sorted, we all shook hands and I returned to the campsite. Without further incident. Just south of Split lies the Cetina Canyon. Worth a look, we thought, and headed off in the van for a daytrip. The views of the canyon were not, to be frank, awe-inspiring for the most part, but a very pleasant bimble away from the coast and up into the hills just inshore took us up the river and round a couple of other towns, before finding ourselves at the fortress of Klis. This was one of the most pivotal fortifications for medieval Croatia, with many rulers over the years using it as a base. 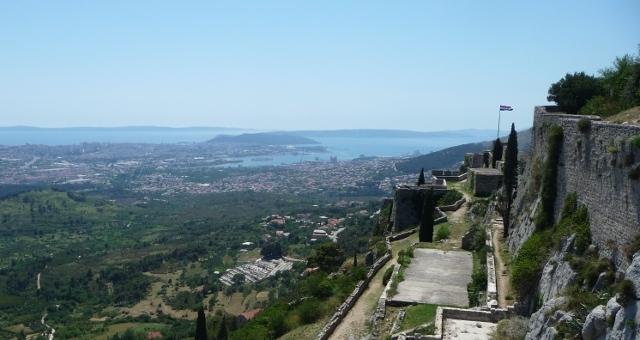 The views from it explained exactly why – high on a ridge, overlooking Split and the strategic trade routes of the northern Adriatic. The castle’s being restored, with several of the buildings inside the keep closed off as they’re worked on, but a wander round the walls was certainly worth the circular route. 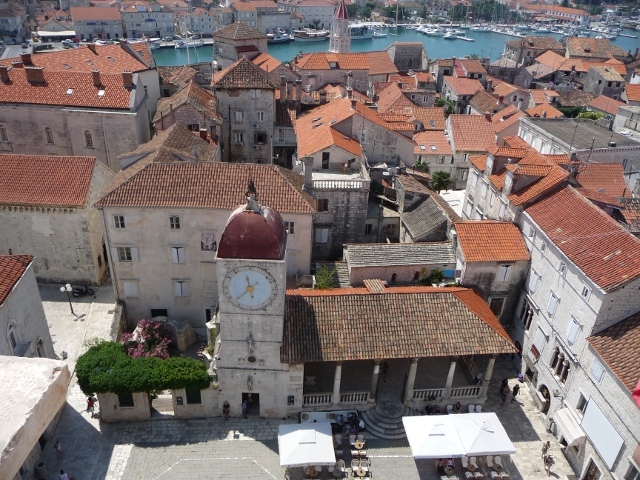 Trogir was our next stop – an old town filling a small island, only a few metres off the coast. We arrived very hot and sweaty, since the temperature had climbed up to the mid 30s, and tried to choose from the campsites available… One was a chunk north of town, a big impersonal site. Next one in was smaller and much more handily located, but somehow a bit characterless. The next island offshore from Trogir, connected by a short bridge, also offered a couple – one looking handy and pleasant, whilst the other was utterly gorgeous, sat in an olive grove tumbling down to the sea – but a lot further out, at the end of a long and steep unmade road. It also turned out to be ferociously expensive, and only have electricity from a generator which was turned off overnight and through the afternoon, to provide some peace and quiet. It wasn’t a hard decision to end up at the first island one, and we quickly decided on a pitch with the sea only a short hop and skip from us. OK, so the view included the back of the shipyard on the island, with a couple of large container ships and an oil rig being built, but you can’t ask for everything, can you? Even better, the site had a restaurant offering the local speciality dish, with the ingredients placed on an iron dish under a cast iron “bell” lid, then baked with hot embers piled over the top. Normally, it’s only available with advance notice – but a quick check showed that it could be cooked for that evening. Another British couple, Peter and Mary, were asking at the same time, so it seemed easier to just arrange a table for four, since the kitchen only had one of the cooking dishes… That made for some negotiation, though, since it meant all four of us had to have the same meat – Octopus, or Veal. They’d just beaten us to it, so we went with their decision of Veal. But, wait a second, it turned out that Peter was the only one really fancying Veal – so he was outnumbered… Later, a feast was placed in front of us. 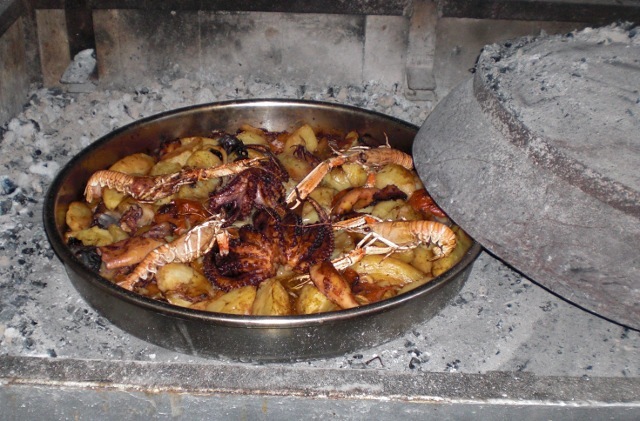 The Octopus was joined by Crayfish and Squid, all with potatoes and other vegetables baked in the juices. Truly delicious. 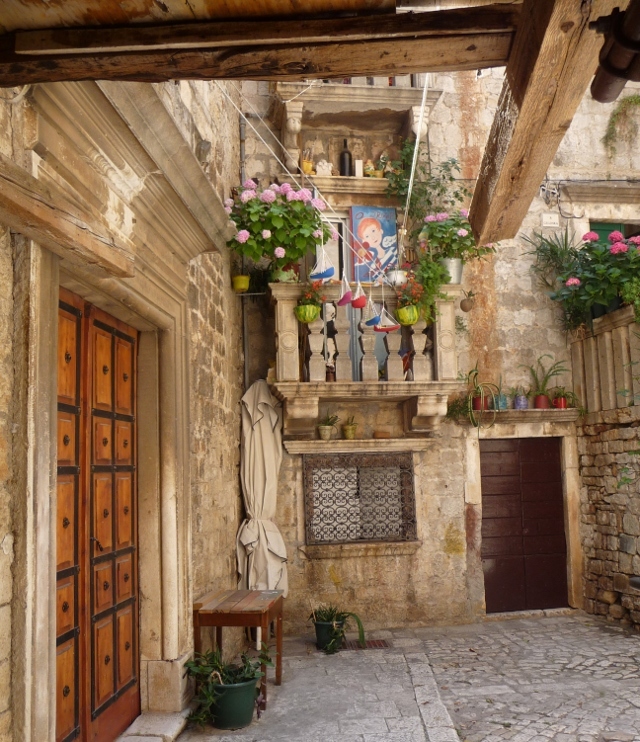 Trogir itself is yet another very pleasant town – small shady squares linked by narrow winding streets. 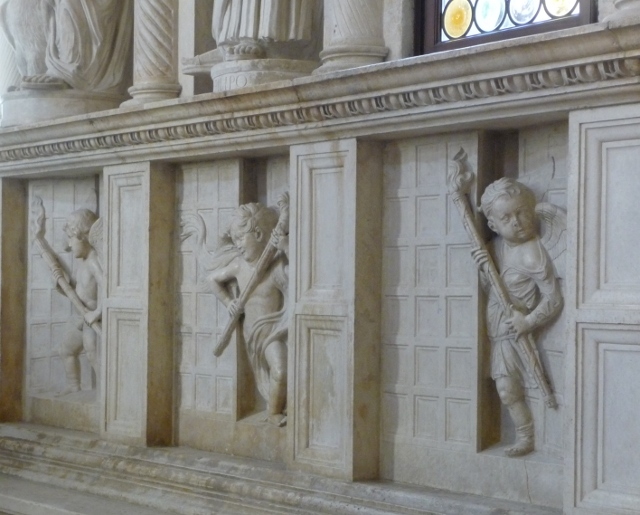 The central square contains a shady colonaded loggia, standing opposite the cathedral – home to some astonishingly lifelike stone carving, especially in one of the side chapels, the walls of which are lined with chubby cherubs peering through half-open doorways. The treasury contained the usual collection of silverwork and old manuscripts, housed in some of the most beautifully carved wooden cupboards we’ve seen. 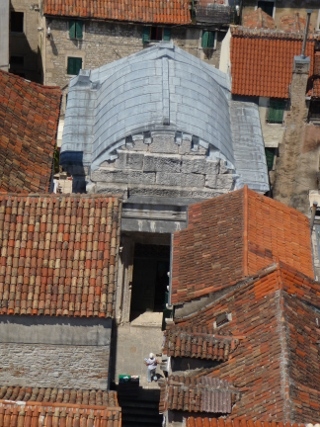 As in Split, a climb up the stairs of the belfry was rewarded with great views over the rooftops. After more aimless meandering around the town, we returned to site to wash the sweat of the day away in the gloriously clear water, as Birgit taught Mary to swim. In the bar later, with a handful of empties to return, we found our waiter from the previous evening wasn’t on duty, and the manager seemed a bit sceptical – but promised to call him and find out. As we sat and chatted, the waiter arrived, had a brief conversation with the manager, then headed over with a huge grin on his face – turns out we’d fallen hook, line and sinker for a setup aimed by Hans at Peter… D’oh. This entry was posted in Art & Culture stuff, By Country - Croatia, Food stuff, Personal stuff, Travel stuff, Wildlife stuff. Bookmark the permalink.